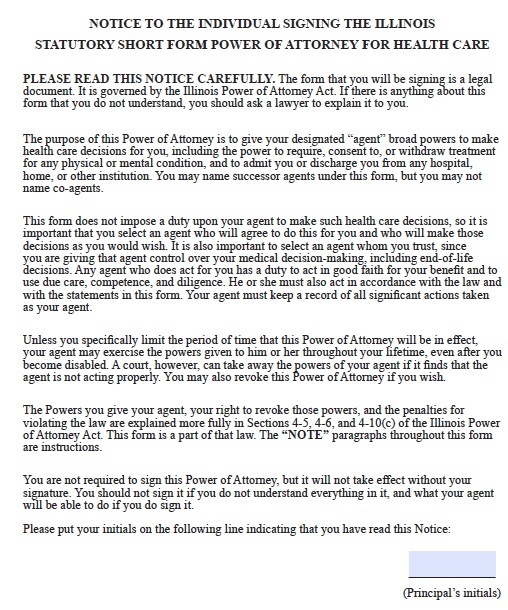 The other primary use of a power of attorney is for healthcare. You can use this document to authorize an agent to make almost any healthcare decision for you, including authorizing or withdrawing medical treatment for any mental or physical condition. The form does not require the agent to make decisions for you, however, so you must know beforehand that the agent is willing to do so. As with any other power of attorney, you must be sure you trust the agent completely and that he or she understands your values and needs. Perhaps the most prominent reason for obtaining this power of attorney is to specify whether you would like to remain on life support if your condition becomes terminal and you will not regain consciousness. If you cannot speak for yourself, it is important to have a document to state your wishes, or else your family will have to make these difficult decisions. In Illinois, principals cannot name co-agents, because it could prove counterproductive if the agents disagree on how to treat the principal. Naming successor agents is legal and encouraged in case the current agent cannot make decisions effectively.